We finished up the Spring Issue of Radiant Magazine which launched online this week! I enjoy designing every issue because it is loaded with incredible content and inspirational contributors...I am always learning something new. There is quite enough For instance, this issue features Bethany Hamilton (the movie Soul Surfer is based off of), Jennifer Miller on bioethics, Reality check on Happily Ever After, etc. etc. I feel blessed that part of my job is being able to do something positive for young women today. There is enough negative and depressing media out there to go around! I focused the Style Watch spread this issue on Wedding Wear since wedding season has begun! ugh i need to get back to the states and start attending some weddings. i want both those looks. now. Ummm...yes YEs YESSS I'll take both looks please! Spring weddings are just the best. Perfect start to the season! going to check out the mag now!! love the offset look of that skirt and dress!! asymmetrical style is so attractive to me!! I always love your style boards! I love the idea of you and the belly sunbathing today! What a great idea! Also, my mouth just dropped when I saw that dress! WOW--I adore the ruffle! i LOVE modcloth and that dress is darling! have a great weekend!!! Love anything by Emersonmade, they are awesome :) Your necklace would go so well with that dress too - Great wedding outfit, love it! Happy weekend! xo. I absolutely love that grey dress! I'd love to have that in my closet right now. My weekend will mostly be taken up by the papers I need to write. The end of the quarter has been so busy, and I hate disappearing, but I only have a little more to do before I'm done and have a full week off! So pretty! I'm going to a wedding next weekend, at the beach! Yay. Off to check out Radiant! i just started thinking about the weddings i'll be attending soon and the fact that i need a new dress! this is perfect inspiration. oh man im adoring both dresses!!!! Those flats are fun-tabulous...and the yellow and gray craze has definitely got me! (c; Happy weekend and happy sun bathing!!! hi Anna I am so happy you feel that way towards your job and the positive impact in the world! I didn't know about the magazine I will make sure to read it all! 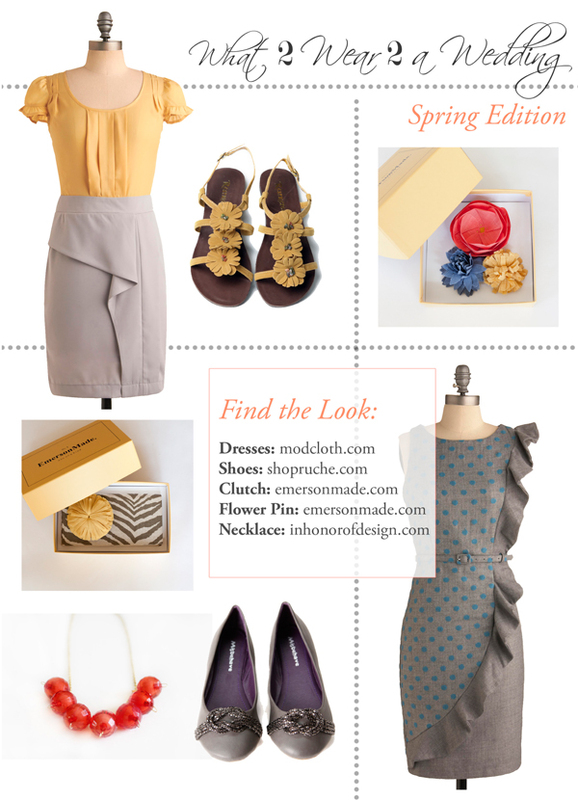 I need to supply my spring wardrobe with lots of yellows. love this anna!! I love those pics! anything from emerson just makes my heart swoon. she can do no wrong! have a wonderful weekend! Beautiful looks! My family just came in from the states and we have a lot of crafting and traveling to do! I am stoked! And awesome magazine, that is so great for young women to have proper role models! Oh wow, love that second dress and those shoes!! I would definitely wear that to a wedding...time for me to shop! that skirt/blous combo is calling my name! so lovely. can't wait to check out that magazine!! loving that clutch too!! super cute! Fantastic!! What an incredible magazine! And I love the spread you posted... that gray blue dress is divine. Gorgeous dresses!! I want both! I love how you styled them too, the colors are just perfect. And what a great magazine too, I can't wait to see what else you guys come up with! Both outfits are beautiful! Especially the shoes for the first outfit, lovely. I have many an opinion on this - first and most important: I LOVE both outfits! You've got great taste lovey! This is a great inspiration board! Now to find a wedding that I could wear these colors too! LOL! Anna, these are 2 beautiful looks you've assembled! i adore the ruffle influence and am really liking springs demure higher necklines a lot. great accessories and your necklace is to die for!!! absolutely love, LOVE that dress with the ruffles!! !